This weekend I went with a group of girls (former co-workers) on a five-hour gambling cruise. I had no idea what to expect, but since it took me 24 hours to blog about it, you can rest assured that I did not win any jackpots. While I've never been to Las Vegas (well, I switched planes in Vegas on my way to Japan, but enough about that), I have been to the casinos in Biloxi and Tampa. 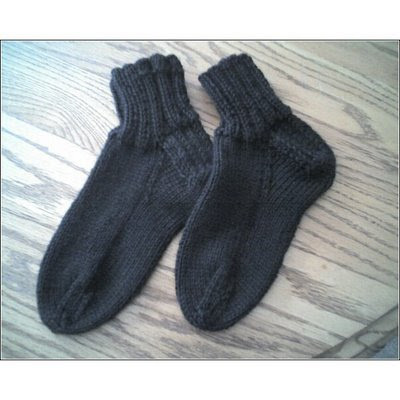 I finished my second pair of socks. They are too big for me but I let one of the girls at work try them on and they fit her. 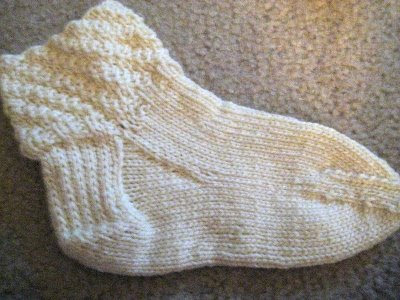 I'm having a bit of problem with the toes but the socks turned out quite well. 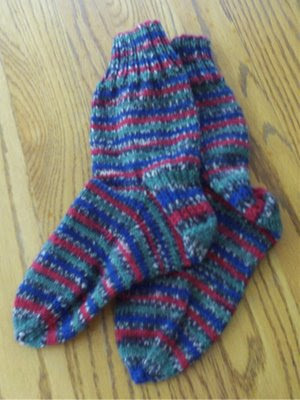 I used proper self-striping sock yarn for this project. How Long Can I Milk This Sock Thing? I loaned my camera to my co-worker. She's on a family vacation to Cooperstown, NY. You'll just have to put up with my camera phone pictures until then. I'm working on a new pair of socks, with self-striping yarn I got on sale at Michaels. I've got to go work on some beer cozies for my brother. He's using our family's patented guilt techniques, handed down over generations, to get me to deliver on my promises.